Texture analyzers, or texturometers, are instruments used to apply scientific methods to the measurement and analysis of product texture. With six test modes (plus calibration check) and a wide choice of accessories, no other texture analyzer has ever done so much without a computer and software. Shimadzu Analytical (India) Pvt. Ltd. 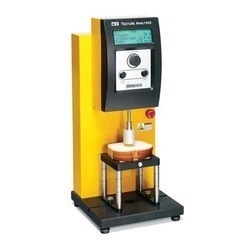 The CT3 is a low cost, but powerful, universal testing machine that offers both compression and tensile testing. It can calculate, through compression and tensile data, a number of physical properties that have proven to be highly correlated to human sensory evaluation of food and other consumer products. Keeping the diverse requirements of the customers in mind, our company is involved in offering a superb quality range of Texture Analyzer.